On this Feast of the Annunciation, we are pleased to announce — albeit without the able assistance of the Archangel Gabriel — that it’s time for a new episode of Monday Madness! Yes, everyone’s favorite video commentary on the ins and outs of Lent Madness is ready to air. 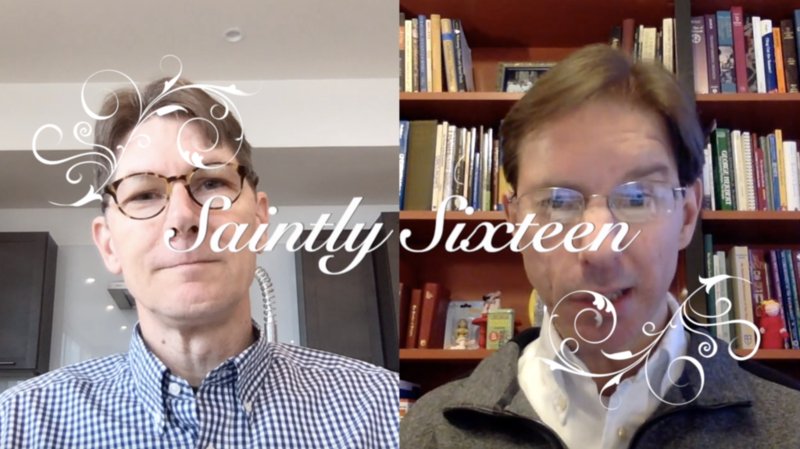 This week, Tim and Scott (collectively, the Walter Cronkite of Lent) preview the imminent arrival of the Saintly Sixteen, and highlight the upcoming epic concluding contests of the Round of the 32. This week, Scott and Tim also return to their usual custom of highlighting the wonders of the Lentorium, where you can buy Official Lent Madness Drinkware, as seen on TV. You can also learn, in an exclusive feature, just how much rehearsal time goes into each week’s groundbreaking presentation (Spoiler Alert: None). If you are sharing this post on social media, this graphic helps. Otherwise, it’s of little use to you. 4 Comments to "Monday Madness — March 25, 2019"
I note that Damien has been in the Lists several times before this year. I suggest that last year’s Runner Up, Maria Skobstova, be considered for future Lent Madnesses, as she is well qualified. What time does the voting end? Tim, is that a Wonder Woman figurine on the shelf behind you?